Those of you who have attempted Japanese knotweed removal in your yards can testify to the fact that the antagonist in this backyard battle is no ordinary weed. Japanese knotweed removal is nigthmarish enough without being in the dark as to the options available to you. The purpose of this short piece is to inform you of one option for removing Japanese knotweed (Polygonum cuspidatum) that is not widely known. You may be aware that the herbicide, glyphosate is often used to remove Japanese knotweed. Glyphosate, widely sold under the brand names, Roundup and Rodeo, can be applied as a foliar spray (i.e., you spray it on the leaves) to stands of Japanese knotweed, using a pressurized garden sprayer. But did you know that glyphosate can also be injected into Japanese knotweed canes? Call it "death by lethal injection" for Japanese knotweed. "What would be the advantage of herbicide injection over a foliar spray?" perhaps you ask. Well, glyphosate is a non-selective herbicide. In other words, it wipes out everything in its path! If you are attempting Japanese knotweed removal in the proximity of desirable plants, an errant foliar spray of glyphosate could wreak considerable havoc upon them. Enter herbicide injection as an alternative method for Japanese knotweed removal. JK Injection Tools is a company that has worked on the problem of making herbicide injection a practical method for removing Japanese knotweed. As JK Injection Tools relates the story on its Web site, "We began in 1997 with an idea that if we could quickly get herbicide into the middle of invasive plants we would be able to achieve better control, while improving safety for ourselves and the environment." Their idea came to fruition in 2003, when they began providing consumers with what they describe as a "delivery system for the injection of herbicide into hollow stem plants." Japanese knotweed is just such a plant. If you inspect a cane of Japanese knotweed closely, you'll see that it is segmented. Where one segment ends and another begins, you will find a node. Between the nodes is a hollow tube, as one finds with bamboo. Indeed, "Mexican bamboo" is one of the nicknames for Japanese knotweed. So what the heck is a "node?" Nodes are the places on a plant's stem from which leaves or branches grow. Likewise, on the branches themselves, the places from which leaves, buds, or other branches grow are called "nodes." Pruning instructions sometimes exploit these nodes as signposts that one can go by to prune a plant. By making your cut above them, you do not lose out on the buds, etc. Note also that many plants put down additional roots where these nodes touch the ground. An example is woodland phlox. Thus you will often see "rooting at the nodes" as a description of one way in which a plant can spread to propagate itself. The nodes are very easy to detect on Japanese knotweed: They are the horizontal lines that you see cutting across the stalk. 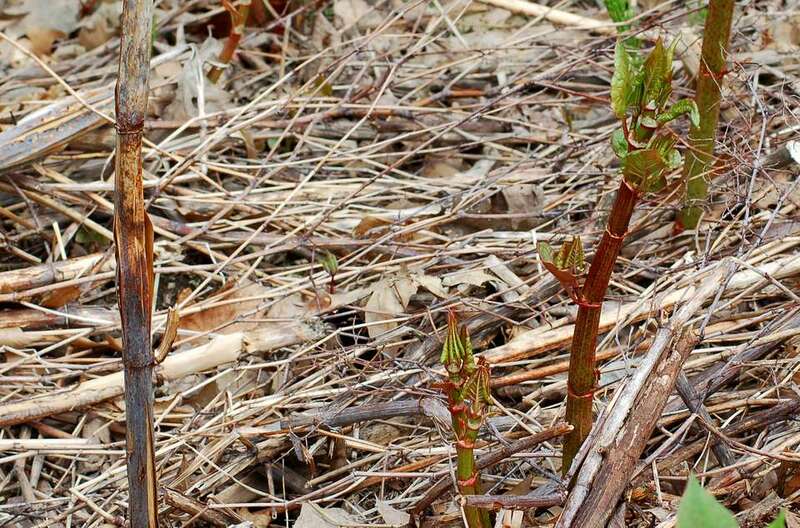 Although it's certainly possible to use the injection method at other times of the year, it is best to wait till late summer or early autumn, when the Japanese knotweed canes are 1/2 inch or more in width between the first and second nodes (up from the bottom). Japanese knotweed plants are herbaceous perennials. Since their leaves die back in winter, it is through their roots that the plants live on. At the end of Japanese knotweed's growing season, nutrients are transferred from the leaves down through the canes and on down to the rhizomes. This transfer, which continues until the first killing frost, presents you with an opportunity to hit Japanese knotweed where it really hurts! Glyphosate injected during this time will "go along for the ride," following the same path down to the rhizomes as the nutrients. And it is the rhizomes which must ultimately be destroyed, if you are to be successful at Japanese knotweed removal. Assemble the three parts of the injection tool. Fill the reservoir with herbicide (follow any mixing directions that may be provided on your herbicide label). Inject the needle between the first and second nodes (up from the bottom) of the Japanese knotweed cane. The herbicide squirts out of a small hole in the needle. After thrusting the needle into the Japanese knotweed cane, make sure this hole is positioned within the hollow area of the cane. Pull the trigger to release the glyphosate. The picture on this page shows you what Japanese knotweed looks like. Check out my "before" and "after" pictures of Japanese knotweed injected with glyphosate (right). The "after" picture was taken fewer than two weeks after injection. Repeat injections of glyphosate in future years as necessary. Japanese knotweed plants are tenacious, therefore Japanese knotweed removal requires tenacity on your part. Be persistent! Is Bamboo Eradication Possible Without Herbicides? Why Do I Have Brown Leaves on My Japanese Maple Trees? What Are Your Options for Removing Snow?